Popsicle orange goodness on sale at Talbots (this "count your blessings" print reflects those same pretty hues). Looked at my maternity clothes and realized my absolute favorites were purchased on ebay. If you haven't looked there first, you should! just shopped the Olive Juice sale and I love what Suze said about allowances, thanks for the links! Love the skirt. What a wonderful color to add a little pizazz to your wardrobe. I love that orange! Maybe that's why my blog is orange, I'm painting furniture orange. I'm sewing orange fabrics. 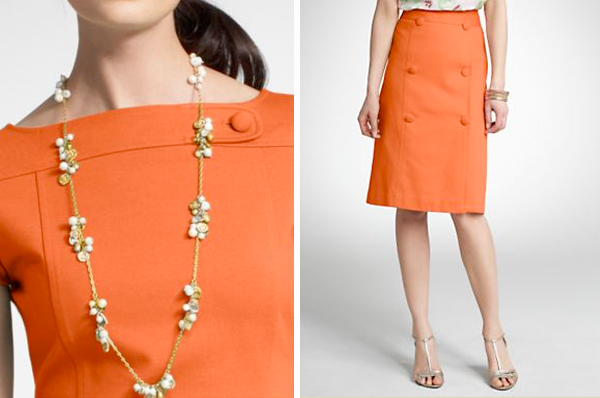 I definitely need an orange skirt! WOW!! i always thought talbot's a place where my mom should shop. i'm totally investing in one or two of those fabulously cut dresses:) and olive juice!! what adorable things. do you find their sizes large or small? i have an on-the-slender size two and a half year old boy. any thoughts? thanks again for these fab links. Beautiful. I never look at Talbots but now I will! Yup...totally had to pick up that skirt for post-baby-lose-50-lbs-motivation. I couldn't help myself. And yes, totally surprised how hip Talbots has become! At least in same areas. Nora, I find that Olive Juice tends to run small, like European clothing. Order a size up and you should be good to go. And I owe you an email! Oh bummer!! I haven't checked your blog cuz we were on vacation and now there is none of that orange goodness available in my size! What great pieces! I hope you snagged some for after the baby! ps--hope that things are okay and that you're not getting too stressed with everything with the baby. Ps--have you heard that 4 is the same as 3? Cuz it is.